Understanding how species distributions will change is one of the most prescient questions in biology. This is key information to help scientists, conservationists and policy makers better predict future patterns of biodiversity and the ecosystem services they provide. Investigations into how species physiologies are correlated with their environment, and the mechanisms underlying these correlations, are a crucial part of improving these predictions. The majority of recent shifts in species ranges have been correlated with increasing surface temperature, highlighting the key effect of temperature on ectotherms. However, multiple factors, such as ocean acidification and salinity, are likely to interact with changes in temperature, leading to shifts in the ecological balance. Latitudinal gradients which incorporate a number of overlapping species ranges are “natural laboratories” for investigating the link between environmental variability and physiological flexibility. Recent advances in understanding the importance of aerobic capacity in setting temperature limits provide a framework for testing the physiological capacity of species that can be applied across these gradients. However, the importance of these mechanisms at different scales needs further investigation as we extrapolate from laboratory experiments to field scenarios. I use a combination of whole animal (e.g. behaviour and reproduction) and tissue biochemistry assays (e.g. metabolic pathways) to investigate the scale at which environmental variability best determines physiological flexibility. Peck LS, Thorne MAS, Hoffman JI, Morley SA, Clark MS 2015 Variability among individuals is generated at the gene expression level. Ecology, 96: 2004-2014. Morley SA, Belchier M, Sands C, Barnes, DKA, Peck, LS 2014 Geographic isolation and physiological mechanisms underpinning species distributions at the range limit hotspot of South Georgia Reviews in Fish Biology and Fisheries 24:485-492. Obermüller BE, Truebano M, Peck LS, Eastman JT, Morley SA 2013. Reduced seasonality in elemental CHN composition of Antarctic marine benthic predators and scavengers JEMBE 446: 328-333.Morley, S.A., Belchier, M., Sands, Barnes, DKA, Peck, L.S. In Press Geographic isolation and physiological mechanisms underpinning species distributions at the range limit hotspot of South Georgia Reviews in Fish Biology and Fisheries. Richard J, Morley, SA, Deloffre, J, Peck LS (2012) Acclimation capacity for four Arctic marine benthic species. J Exp Mar Biol Ecol 424: 38-43. Morley SA, Martin SM, Bates, AE, Clark MS, Ericson J, Lamare M, Peck LS (2012) Spatial and temporal variation in the heat tolerance limits of two abundant Southern Ocean invertebrates. Mar Ecol Prog Ser. 450: 81-92. Morley SA, Hirse T, Thorne MAS, Pörtner HO, Peck LS (2012) Physiological plasticity, long term resistance or acclimation to temperature, in the Antarctic bivalve, Laternula elliptica. Comp Biochem Physiol A. 162: 16-21. Richard J, Morley SA, Peck LS (2012) Upper temperature limits in temperate marine species: a macrophysiological view. PloS One. 7: e34655. tropical marine ectotherms: Global warming implications PLOS One 6(12) e29340. Lai CH, Morley SA, Tan KS, Peck LS (2011) Thermal niche separation in two sympatric tropical intertidal Laternula (Bivalvia: Anomalodesmata). J Exp Mar Biol Ecol 405, 68-72. Obermüller, BO, Morley SA, Clark MS, Barnes DKA, Peck LS (2011) Antarctic intertidal limpet ecophysiology: A winter-summer comparison. J Exp Mar Biol Ecol 403, 39-45. Barnes DKA, Kuklinski P, Jackson JA, Keel GW, Morley SA, Winston JE (2011) Scott’s collections help reveal accelerating marine life growth in Antarctica. Current Biol 22(4) R148. physiological capacity to distributional changes in response to climate change. Ant Science.22, 774-781. Ericson JA, Lamare MD, Morley SA, Barker MF (2010) The response of two ecologically important Antarctic invertebrates (Sterechinus neumayeri and Parborlasia corrugates) to reduced seawater pH: effects on fertilisation and embryonic development. Mar Biol 157: 2689-2702. Obermüller BO, Morley SA, Barnes DKA, Peck LS (2010) Seasonal physiology and ecology of Antarctic marine benthic predators and scavengers. Mar Ecol Prog Ser 415: 109-126. Peck LS, Morley SA, Clark MS (2010). Poor acclimation capacities in Antarctic marine ectotherms. Mar Biol. 157:2051-2059. Lurman GJ, Blaser T, Lamare M, Tan KS, Pörtner H, Peck LS, Morley SA (2010) Ultrastructure of pedal muscle as a function of temperature in nacellid limpets. Mar Biol 157: 1705-1712. Morley SA, Clark MS, Peck LS (2010a) Depth gradients in shell morphology correlate with thermal limits for activity and ice disturbance in Antarctic limpets J Exp Mar Biol Ecol 390: 1-5. Barnes DKA, Peck LS, Morley SA (2010) Ecological relevance of laboratory determined temperature limits: colonization potential, biogeography and resilience of Antarctic invertebrates to environmental change. Glob Change Biol 16:3164-3169. Lurman GJ, Blaser T, Lamare M, Peck LS, Morley SA (2010) Mitochondrial plasticity in brachiopod (Liothyrella spp.) smooth adductor muscle as a result of season and latitude. Mar Biol, 157:907-913.
latitudinal comparison between Southern Ocean molluscs. Comp Biochem Physiol A 152: 423-430. Morley SA, Peck LS, Tan KS, Martin SM Pörtner HO (2007a) Slowest of the slow: latitudinal insensitivity of burrowing capacity in the bivalve Laternula. Mar Biol. 151: 1823-1830. Atkinson D, Morley SA, Hughes RN (2006) From cells to colonies: At what levels of body organization does the “temperature-size rule” apply? Evol and Develop 8: 202-214. Rogers AD, Morley S, Fitzcharles E, Jarvis K, Belchier M (2006) Genetic structure of Patagonian toothfish (Dissostichus eleginoides) populations on the Patagonian shelf and Atlantic and western Indian Ocean Sectors of the Southern Ocean. Mar Biol 149: 915-924 DOI 10.1007/s00227-006-0256-x. Barnes DKA, Linse K, Waller C, Morley SA, Enderlein P, Fraser KPP, Brown M (2006) Shallow benthic fauna communities of South Georgia Island. Polar Biology. 29: 223-228. DOI 10.1007/s00300-005-0042-0. Morley SA, Belchier M, Dickson J, Mulvey T (2005) Daily otolith increment validation in larval mackerel icefish, Champsocephalus gunnari. Fish Res 75: 200-203. Hughes RN, Manriquez PH, Bishop JDD, Morley S, Craig SF (2004) Kin or self recognition? Colonial fusibility of the bryozoan Celleporella hyalina. Evol Develop 6: 431-437. Morley SA, Mulvey T, Dickson J, Belchier M (2004) The biology of the bigeye grenadier at South Georgia. J Fish Biol 64(6): 1514-1529. Dickson J, Morley SA, Mulvey T (2004) New data on Martialia hyadesi feeding in the Scotia Sea during winter; with emphasis on seasonal and annual variability. J Marine Biological Association of the UK 84: 785-788. Morley SA, Belchier M (2002) Otolith and body size relationships in bigeye grenadier (Macrourus holotrachys) in CCAMLR subarea 48.3. CCAMLR Science 9: 133-143. Atkinson D, Morley SA, Wheetman D, Hughes RN (2001) Offspring size responses to maternal temperature in ectotherms In: Environment and animal development (eds. Atkinson D. and Thorndyke, M.). 269-285. BIOS: Oxford. Morley SA Batty RS, Geffen AJ, Tytler P (1999) Egg size manipulation: a technique for investigating maternal effects on the hatching characteristics of herring. J Fish Biol 55 (Supp. A): 233-238. Coombs SH, Conway DVP, Morley SA, Halliday NC (1999) Carbon content and nutritional condition of sardine larvae (Sardina pilchardus) off the Atlantic coast of Spain. Mar Biol 134: 367-373. Morley SA, Batty RS (1996) The effects of temperature on S-strike feeding of larval herring, Clupea harengus L. Mar Behav Physiol. 28: 123-136. Morley, S.A., Lurman, G.L., Skepper, J.N., Portner, H-O., Peck, L.S.. (2009) Thermal plasticity of mitochondria:a latitudinal comparison between Southern Ocean molluscs. Comparative Biochemistry and Physiology, 152A. 423-430. Morley, S.A., Mulvey, T., Dickson, J., Belchier, M.. (2004) The biology of the bigeye grenadier at South Georgia. Journal of Fish Biology, 64. 1514-1529. Morley, S.A., Belchier, M.. (2002) Otolith and body size relationships in bigeye grenadier (Macrourus holotrachys) in CCAMLR Subarea 48.3. CCAMLR Science, 9. 133-143. I completed my PhD in larval fish physiology, registered at the University of Liverpool with research conducted at the Scottish Association for Marine Sciences in Oban. 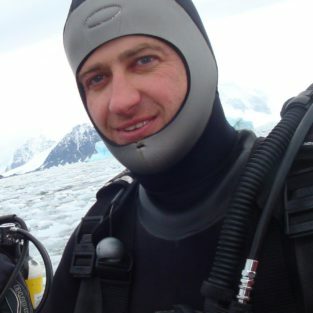 My career has developed through the ecophysiology of bryozoans, in response to temperature and oxygen, before a stint as senior wintering scientist at the British Antarctic Survey’s fisheries research laboratory in the Sub-Antarctic Island of South Georgia. This lead to my current position as an ecophysiologist at BAS. I am also a BAS Innovation Champion for the Biodiversity Evolution and Adaptations Team within BAS. My aim for innovation is to connect our research on cold environment adaptation to wider applications with added value to society. PhD, University of Liverpool. 1998. Jan 2004-present Ecophysiolgist at the BAS.